It is Independence Day in Mexico today. 205 years have passed since the start of the armed conflict which eventually succeeded in expelling the Spaniards from what was the Viceroyalty of New Spain (Nueva España), allowing Mexico, as an independent nation, to be born. Understandably,the day has long been and continues to trigger an outpouring of great patriotism and pride. In city and town squares all over the country, el grito de Dolores (the cry of Dolores), is reenacted and responded to with heartfelt cries of “VIVA MÉXICO!” In the weeks and days before the celebration, vendors flock to the streets to sell all manner of tri-coloured paraphernalia. Last night, fireworks lit up the night sky over Mexico City’s historic centre. However, there are millions of proud Mexicans who dearly love their patria but feel that there is currently little to celebrate in Mexico. Top and centre in the long list of grievances, but by no means the only one, is the unresolved case of the missing rural teaching students from Ayotzinapa. September 26 will mark the 1 year anniversary of a tragic and shocking case which is, according to many common folk in the street, human rights observers, the nation’s most respected investigative journalists and many, many more, still unresolved. The truth has not been established. The government line, claimed by President Peña Nieto and his cronies to be definitive, that the students were handed over to a drug cartel in Guerrero and burned in a municipal dump, has not been swallowed by a sceptical public and least of all by the parents of the students. Reports say that they will meet Peña Nieto again on September 24. In this Mexican lottery series, I initially thought that the quintessential image to represent la bandera would be the huge Mexican flag which flies high over the capital’s downtown in la Plaza de la Constitución. I spent some time to take a worthy shot in which the flag unfurled in all of its red, green and white glory. 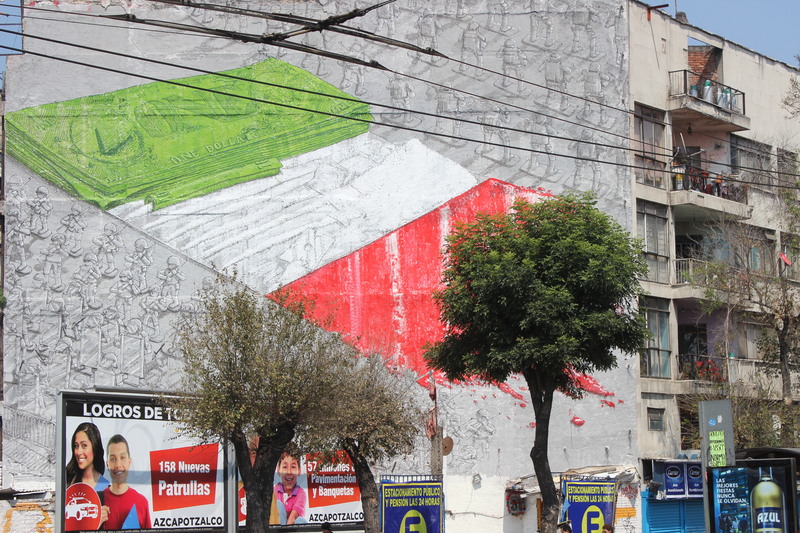 However, given the sentiment of millions of dissatisfied Mexicans, I have chosen the warped image of the Mexican national flag that I published previously in Muralists get political in México DF. It succinctly expresses the cause and effect of Mexico’s insecurity issues. There is much to be celebrated about living in Mexico but the violence and insecurity that affects millions of the citizens of this country cannot be ignored. Happy Independence Day 2015.